Brent crude prices tumbled over 4 percent to levels not seen since April 2004 on Thursday as as a sliding yuan and a second emergency halt in China's stock trading this week left Asian markets in turmoil. A huge supply overhang and near-record output levels also continued to drag on oil prices, which have now shed 70 percent in value since the current downturn began in June 2014, causing pain to companies and governments that rely heavily on oil revenues. China accelerated the depreciation of the yuan on Thursday, sending regional currencies and stock markets tumbling as investors feared the Asian giant could trigger competitive currency devaluations from trading partners. China's stock markets were suspended for the rest of the day, less than half an hour after opening, as a new circuit-breaking mechanism was tripped for the second time this week. Mirroring the weakness across financial markets, the global benchmark Brent LCOc1 fell 4 percent to a low of $32.75 per barrel shortly after 0600 GMT (1 a.m. ET), a level not seen since April 2004. "With oil markets producing 1 million barrels a day in excess (of demand) and very little sign of any rational response from the supply side, it's little wonder we're seeing pressure again," said Michael McCarthy, chief market strategist at CMC Markets in Sydney. The oil price crash comes on the back of near-record output from major producers such as the Organization of the Petroleum Exporting Countries (OPEC), Russia and North America, which has left storage tanks brimming with supplies. 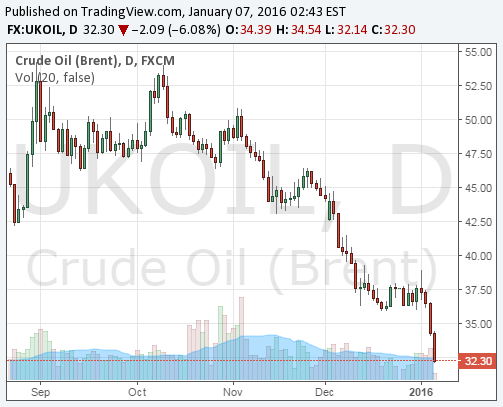 The plunge in prices is causing countries that rely heavily on oil export revenues economic pain. The premium for Saudi 5-year credit default swaps (CDS), a bankruptcy insurance, has more than tripled since late 2015 to over $180 (see chart). Exacerbating the oil market woes is weakening demand, especially in Asia, home to the world's No.2 oil consumer, China, that is seeing the slowest economic growth in a generation. "The Chinese economy actually contracted in December and that's adding fire to fears of a more rapid slowdown in the world's second biggest economy," McCarthy said. With the global economy looking shaky due to China's slowdown, analysts said the outlook for oil remains for cheap prices for much of this year. 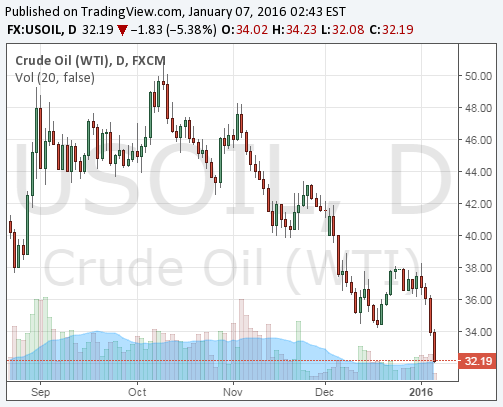 In the United States, West Texas Intermediate (WTI) futures CLc1 were also down around 4 percent to $32.53 per barrel, a December 2008 low. If prices fall below $32.40 WTI, like Brent, will be at levels last seen in 2004. Analysts said a buildup in U.S. stockpiles was the main reason for the drop in WTI prices. "The U.S. inventory numbers showed a 16 million increase in distillates and other products, so it's clear they're still producing at rates that are unsustainable," McCarthy said. The huge storage overhang means that even if U.S. production falls this year as drillers succumb to low prices, it will take many months to work down excess supplies.